Quarks are one type of matter particle. Most of the matter we see around us is made from protons and neutrons, which are composed of quarks. There are six quarks, but physicists usually talk about them in terms of three pairs: up/down, charm/strange, and top/bottom. (Also, for each of these quarks, there is a corresponding antiquark.) 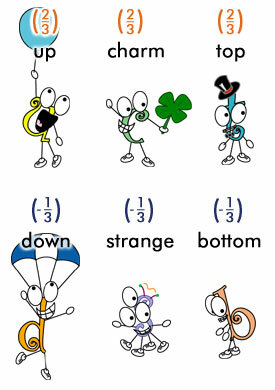 Be glad that quarks have such silly names -- it makes them easier to remember! Quarks have the unusual characteristic of having a fractional electric charge, unlike the proton and electron, which have integer charges of +1 and -1 respectively. Quarks also carry another type of charge called color charge, which we will discuss later. The most elusive quark, the top quark, was discovered in 1995 after its existence had been theorized for 20 years. Want to see a particle physicist's idea of a good pun?